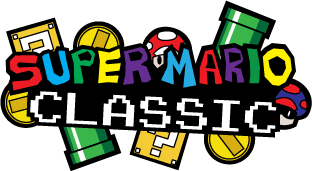 Super Mario Classic: Returns: Return 2: The Revenge of the Return: Reloaded, occasionally shorthanded to Super Mario Classic: Subsandwich later called Super Mario Classic, was a fangame in production by Zero Kirby. It was meant to be a re-imagining and revival of his old Super Mario Classic games after their poor quality clashed with his interests. The original long title was developed while talking to a friend about the remake - the shorthand title is taken from a joke made by a pair of Let's Players, and is a reference to the common rereleases of the Metal Gear Solid series with "subsomething" subtitles. Just like the original Super Mario Classic: Return, the game was displayed in overhead style, updated to Bowser's Inside Story sprites. This was changed during production due to the lack of graphics made in BIS style. The game was meant to be a standard platform adventure like the original Super Mario Classics, most similar to Super Mario Classic: Return in particular, hence the original name. Much like in that game, Mario has an eight-point health meter that decreases as he takes damage - however, this game is not planned to use a lives system like most other games. Instead, deaths are penalized either by returning to the very start of the stage, or paying a set number of points to start over from a checkpoint if the player has reached it. This is significant as the game will rank your final score at the end of a level - the more points you have, the better your rank will be. 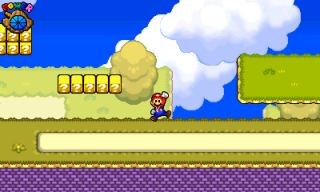 The player can also pause the game and restart from the beginning or checkpoint, or even just leave the level, but they lose their powerup in the process if they do this. Also like the original Super Mario Classics the game uses the overhead style from Mario and Luigi - Bowser's Inside Story to be precise. There's a few other sprites from previous games but they are being updated to fit the BIS style more closely to minimize clashing. Other aspects of the game are very stylized, from level intros offering "helpful hints" to the score countup screen, to a fully animated main menu with a built-in instruction manual. Like in Returns, this one will feature a map system - however it will be far more complete and much less linear. It's based on Super Mario World's, but edited and recoloured to look more up-to-date and mesh with the platforming graphics better. Control for swimming is slightly different from most other games - Mario is able to float completely freely without gravity acting upon him. Because of this he can't access doors or pipes hidden underwater unless he is Metal Mario. He also has an Air Meter that slowly depletes as his head remains underwater. Surfacing or finding air bubbles replenishes his air. The powerups in this game are the exact same ones originally announced for Super Mario Zero - the Fire Flower, Ice Flower, Speed Mushroom, and Metal Cap. Of course, the Fire Flower lets you shoot fireballs to defeat tougher enemies, and the Ice Flower lets you shoot Ice Balls to freeze enemies for use as platforms, both of which are fairly standard. The new Speed Mushroom transforms Mario into Boost Mario, who can charge up a Boost Jump to cross large gaps or make higher jumps. The Metal Cap, much like in Super Mario 64, doesn't actually affect Mario's weight and simply makes him unable to swim - he otherwise controls normally, can access underwater doors and pipes, and can use a Ground Pound to break blocks directly beneath him. There's also the Starman, which makes Mario invincible for a short amount of time, and the Mushroom, which restores Health. Mario can also carry one powerup with him in a spare box. Light Beams, either in their functionality from the original Classic or Return, are not returning to the game. However, Barrel Cannons, which were featured in the very original Classic, are returning. In the Light Beams' place there is a skydiving mechanic, where Mario freefalls through a vertical level. While freefalling, Mario can perform a Spin Move which can break certain blocks and defeat enemies. Music for the game, unlike Return, will feature more Mario tracks in contrast to the Sonic-dominated original. The music will also be in .OGG format using Supersound, compared to the MIDIs of the original games. Three worlds have been confirmed so far. World 1: Basic Beginnings is a simple intro world based on grasslands, with some underground areas and a castle at the end. World 2: Sunset Heights is a sunset-themed level with more emphasis on precise platforming. World 3: Downpour Ruins is a flooded ruin area, with rain and large amounts of water to swim through. All the worlds in the game are based on worlds from the original Classic series - Basic Beginnings from World 1 of Classic, Sunset Heights from Sunset Dreams of Classic, and Downpour Ruins is a combination of Ancient Prophecies from Classic and Rainy Valley from Return. Worlds as yet to be revealed will follow suit. Eventually, Zero Kirby changed the graphical style to be completely 2D, instead of using the 2.5D overhead style. This was because of the lack of graphics in the Bowser's Inside Story style. What makes the new style unique, however, is that Zero Kirby has programmed in-engine shading. The new graphics also have a bit of Classic history in the, since they're edits of Mario's sprites used in Super Mario Classic Two: Mushroom Archipelago. The game was cancelled after Zero Kirby stopped working on it. The topic on MFGG. A video showcasing both the .OGG music and animated menus. This page was last edited on 27 November 2018, at 05:36.